The fourth annual Glass Gathering Art Show took place on May 13, 2017 at Harmony Stained Glass in Pasadena, Texas. The show grew again as more artists were accepted than in 2016. The artwork was varied, technically challenging and exhibited aesthetic excellence. A new category of work, 3D/Mixed Media, was added this year and was very well represented. Artists and attendees enjoyed a wine and cheese reception while making connections at the close of the evening. Thanks to our host, Joyce Sullivan; our judge, Cindi Strauss of the MFAH; and to all the volunteers from Glass Gathering who prepared and staged the show. This exhibit is one of very few dedicated to the medium of glass in a wide variety of techniques; join us next year in May, 2018 when we exhibit again! Cindi Strauss is the Sara and Bill Morgan Curator of Decorative Arts, Craft, and Design, and Assistant Director, Programming at the Museum of Fine Arts, Houston. She received her B.A. with honors in art history from Hamilton College and her M.A. in the history of decorative arts from the Cooper-Hewitt/Parsons School of Design. At the MFAH, Cindi is responsible for the acquisition, research, publication, and exhibition of post-1900 decorative arts, design, and craft. Recent exhibitions include Beyond Craft: Decorative Arts from the Leatrice S. and Melvin B. Eagle Collection (2014); Shifting Paradigms in Contemporary Ceramics: The Garth Clark and Mark Del Vecchio Collection (2012); Liquid Lines: Exploring the Language of Contemporary Metal (2011); and Ornament as Art: Avant-Garde Jewelry from the Helen Williams Drutt Collection (2008). She has authored or contributed to catalogues and journals on decorative arts and design topics and has been a frequent lecturer at museums nationwide. Initially, I am looking for work that shows not only technical competence but aesthetic refinement. Creativity, issues of color management, handling of transitions and compositional flow are very crucial to the success of a work. Evidence of intentional thought put into the presentation method of the piece is also important. Once these criteria are met, I also look for the “wow factor”; an artwork that additionally speaks to the viewer strongly on some level. This impact is not necessarily an issue of scale or complexity; I am looking for depth over dazzle. 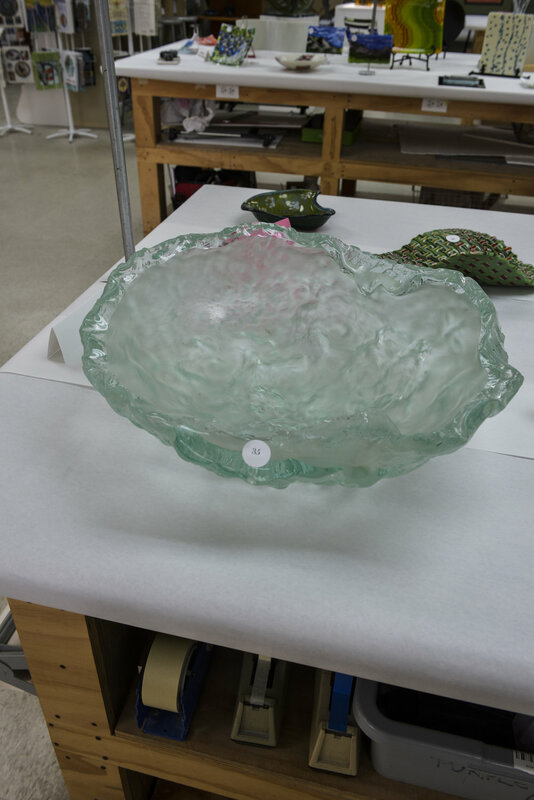 As a result of attending two workshops designed for curators, in which I had the opportunity to handle glass and speak with glass artists at Pilchuck and the Corning Museum, I am aware of the challenges of working with glass as an artistic medium so I appreciate the difficulty which it presents! To Harmony Stained Glass, Glass Gathering, and all the artists, thank you for inviting me to jury the exhibition.